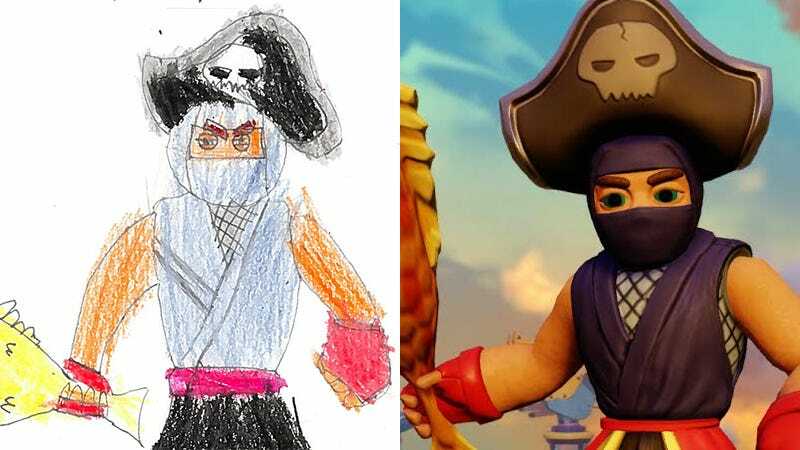 Earlier this week Activision introduced Skylanders Imaginators, a game where players can make any character they wish, with a child’s drawing of a character named Plunder Fist. Some commenters were concerned that they did not include an in-game image of Plunder Fist, so I asked them to make one. It really was kind of a silly oversight. The first thing I was shown in the game intro meeting was Plunder Fist, so I fully expected to see a hybrid pirate/ninja wandering about with a weaponized fish. As I arrived to the meeting not having slept the night before, I soon got distracted by something shiny and forgot all about his Fish of Fury. So they started off by showing you that child’s drawing, and then they never showed a way to make that drawing actually exist in the game? I mean, I kept reading on the expectation that we’d see some analogue to “Plunder Fist.” If they couldn’t provide that as an illustration of what they can accomplish, I question the point of... well, either showing the original drawing OR the claiming to have such a character creation system: Take your pick. I pledged to RappingNinja that I would not rest until I had an in-game picture of Plunder Fist. This one is for you, Mr. Silent-But-Rhythmic. Pirate hat? Check. Ninja outfit? Check. Peg leg? Check. Weaponized fish? You bet. It looks like they evened modeled the fish from the drawing. I saw many of these parts during the demo I was shown of the game, so it was just a matter of putting them together, getting the coloring right and snapping a pic. And now the first thing I will be doing when Skylanders Imaginators hits in October is creating my own Plunder Fist. Maybe we’ll get lucky and Toys for Bob will let us share characters via QR codes or something.